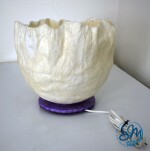 Technique: Splendid table lamp, in cellulose paper and cotton fiber, entirely modeled by hand. It represents a bird in flight. Sea retrieval wood structure. It represents a fish captured by a net. Base of reclaimed wood, coming from the sea as well as some parts of the outline. 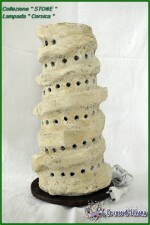 Technique: Polymaterial table lamp with perforated tuff effect. Very special and sought after design. Extremely removable stem for replacing the bulb. Cotton ivory white cap with theme writing. Pleasant and nice hinge on the shaft placed vertically. 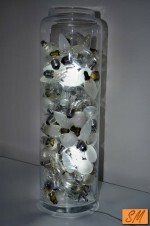 Technique: A glass jar high about 80 cm, filled with old incandescent bulbs, becomes a magnificent lounge lamp. Of the woods thrown by the sea on the wet in the beaches of the Po Delta to the creation of what I imagined was the rest of a wreck after a storm. Special Creation. 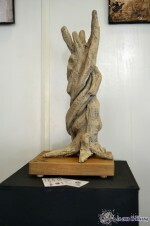 In this case I abandoned for a moment my first love, the paperback, to create a sculpture of raw clay. Hand-molded and left to rest until full drying, in my mind represents what we all love most of all: our mom. 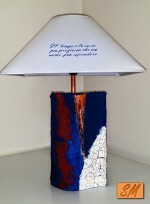 Leaning on a fir-tree base that completes the shape and then hand-painted. 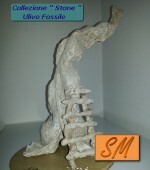 Of the same series Stone that in my imagination is a centuries-old olive tree transformed by nature and fossil weather. One of the creations that most involved me emotionally. Always very close to the beautiful land of Puglia, I have continually picked up the most striking sides, both in my paintings and in my sculptures. 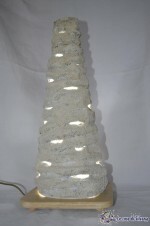 An explanatory example is the Stone Collection where I was inspired by the Puglia tuff. Right from the creation of this collection, I extracted what I represent more than anything else about Apulia: the olive tree! With its six million and over of olive trees, the most secular, Apulia has absolutely breathtaking landscapes. This work is dedicated to those landscapes.